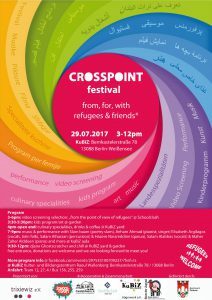 CROSSPOINT Festival By, For, & With Refugees & Friends* (29.07.2017) – trixiewiz e V.
The Trixiewiz team is happy to thank all of you for your support and solidarity in the organisation of the Crosspoint Festival. It was so exciting and motivating to collaborate with you all. Now, we are meeting again at the CommUnity Carnival on 16.09.2017. 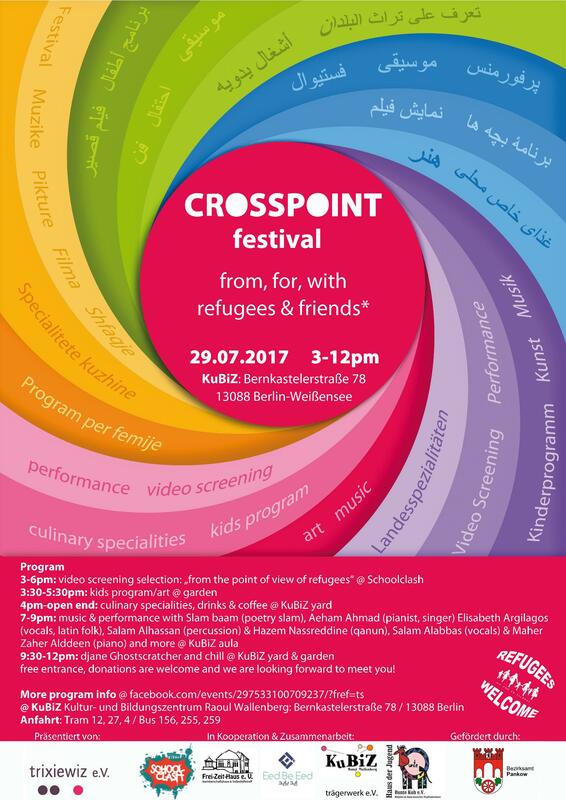 CROSSPOINT is a festival with, by, and for refugees & friends* – a crossing point for ideas, skills, and opportunities and a space for people, groups, and artists to meet, share experiences, and exchange their work and talents. We look forward to welcoming all of you. Feel free to bring your friends and family and spread the word. Entrance is free. Donations are welcome and will be distributed to various projects and initiatives assisting refugees. Donations will go toward the network We’ll come united – Antiracist Parade + CommUNITY-Carnival for the organization of the antiracist parade on the 16th of September in Berlin.